Driving down the cost and pounds per kiloWatt (kW). Revised plans to build a ~1 MW (MegaWatt) pilot power plant in 2010. Cool Earth Solar CEO Rob Lamkin pitched the company at the 22nd National Renewable Energy Laboratory’s (NREL) Industry Growth Forum last week in Denver, Colorado. I am very excited about the Cool Earth Solar technology. It was developed specifically and with the intent of further driving down the cost of solar and being able to ramp up and scale the business massively. Describing the inflated solar concentrator, Mr. Lamkin highlighted the minimal use of cheap and abundant materials such as plastic thin films to form the concentrator balloon. The balloon is 10 feet (~3.05 meters) across and uses about 2 pounds (~0.91 kilograms) of plastic. Sunlight entering the clear top film is reflected by the inside bottom film onto a water cooled PV (Photovoltaic) receiver resulting in 300 to 600 times concentration depending on the PV material utilized. Each concentrator can generate over 1 kiloWatt (kW) with active air inflation to maintain focus, a closed loop water system for receiver cooling, and two axis tracking to keep it on sun. Mr. Lamkin claimed Cool Earth Solar had a huge advantage in minimizing material use and compared Cool Earth’s 120 pounds (54.4 kilograms) per kW to wind turbines which require about 1000 pounds (454 kilograms) per kW. We believe by next year we’ll be able to clearly demonstrate we are at $1 per Watt installed with a Cool Earth Solar power system. This will allow us to meet fossil fuels and allow us to scale up the business very rapidly. The initial market focus of Cool Earth Solar is the six (6) southwestern United States representing a 1028 TWh (TeraWatt-hour) electricity market by 2020 and an unmet RPS (Renewable Portfolio Standard) mandate of 218 TWh. Cool Earth Solar is targeting around five (5) percent of the southwestern market or 11 TWh per year by 2020 and generating some $1.5 Billion in revenue. After Cool Earth Solar founder, President, and CTO Dr. Eric Cummings bootstrapped and obtained seed funding for the patent filings and the Gen 1 (first generation) prototype, the February 2008 $21 million Series A financing enabled the deployment of Gen 2 prototypes. Over the summer, once we collected that operating data, we developed and designed our third generation (Gen 3) of the technology and I am excited to report that we are now deploying that out into the field. We plan to collect over the winter and into the spring the very important field data and operations data of our equipment. And with that we believe we will be well poised by spring, early summer next year, to go out and seek our Series B round of financing and seek project financing so that we can ramp up our business. We want to ramp from where we are at today at an ability to do 50 MW a year up to 500 MW a year with the closing of this new financing. Cool Earth Solar’s 1 MW scale pilot power plant construction plans have therefore been delayed since “Cool Earth Solar Constructing First Solar “Balloon” Prototype Plant” by Ariel Schwartz at CleanTechnica or even the recent “Cool Earth: Inflatable solar technology” by Courtney Roby for GreenMomentum. Gen 3 prototypes are being deployed now and will be tested through 3Q2010. Around 2Q2010, Cool Earth Solar plans to begin construction of the 1 MW pilot power plant with completion slated for year end 2010. Subsequent plans call for the development, project financing, and construction of a 10 MW plant in 2011 followed by the construction start of a 500 MW plant towards 4Q2012. Cool Earth Solar is an Independent Power Producer (IPP) and will build, own, and operate solar power plants based upon their proprietary Concentrated PhotoVoltaic (CPV) technology. Cool Earth will generate revenue by selling electricity from their solar plants via long term Power Purchase Agreements (PPAs) or Feed-in Tariffs (FiTs) with Investor Owned Utilities (IOU) and Municipal Utilities. In fact, the first 1 MW pilot plant will be equity funded and will seek to leverage Feed-in Tariffs offered by PG&E (Pacific Gas and Electric Company) or SMUD (Sacramento Municipal Utility District). Cool Earth Solar will develop typical projects sized from 10 to 20 MW. A 10 MW solar plant will cover about 100 acres (40.4 hectares) and can be sited on disturbed land from cattle grazing, farming or other uses. Cool Earth believes the smaller size will facilitate siting closer to load and avoid transmission issues. Cool Earth Solar plans to seek $75 Million to $90 Million Series B Equity financing in the spring or summer of 2010 and $50 Million Project financing. What is exciting about 100 MW of Cool Earth Solar power plants is this can produce over $30 Million in revenue each year which gives us a very good payback and provides us more fuel for growth and deploying even more and more MegaWatts of Cool Earth plants. Here are a summary (not verbatim unless quoted) of select responses by Mr. Lamkin to questions from the VC (Venture Capitalist) dominated investor panel judging his presentation. Cool Earth Solar will gang projects to do a larger financing of a say 100 MW project pool and at $1 per Watt installed that would represent $100 Million. Series B equity and money left over from Series A will support the equity portion of plant construction. A 10 MW project will generate $3 Million in revenue per year with $800000 in annual Operations and Maintenance (O&M) costs. I spoke with Mr. Lamkin just before his presentation. Once key reason Cool Earth Solar participated in the Forum was to raise their profile with NREL. In addition to the 2009 NREL-Deutsche Bank Climate Change Advisors Venture Awards cash prizes, the Forum promises in-kind commercialization support from NREL. 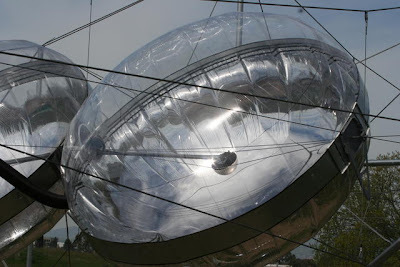 Above is a rare photo of the Cool Earth Solar balloon (“inflated solar concentrator”) with an integrated PV receiver from the Radiant Energy website. The balloon shown by Cool Earth Solar at the California Clean Tech Open 2009 Launch in March was sans PV receiver. I have heard the receiver has been subject to multiple redesigns. However, Mr. Lamkin told me the principle reasons for Gen 3 were rigging and tracking enhancements. If Cool Earth Solar can achieve their $1 per Watt installed price target, they could become a formidable reverse auction adversary should the California Public Utilities Commission (CPUC) adopt their nonsensical Feed-in Tariff reverse auction pricing proposal. In Solar I have a new research for a new Solar system great output power or cheap energy, must be done at any weather even dark night , using heat and photovoltaic together, its power must be more 4 once any Solar cell (over 800 watt /sq. meter) and other benefits. Do we can partnership in it to patent it and make it through your abilities ?